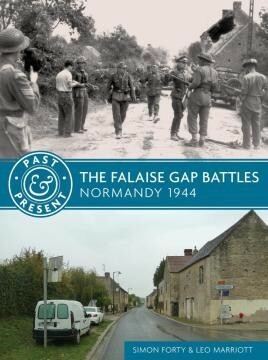 Photographs old and new reconstruct the fierce fighting around Falaise and Chambois in 1944, providing a vivid comparison between then and now. The denouement of the battle of Normandy, the fighting around Falaise and Chambois in August 1944 and the pursuit of the retreating German armies to the Seine provided the Allies with an immense victory. After ten weeks of hard attritional fighting, the Allies had broken loose from the bocage and the Germans' deep defenses around Caen: by the end of September they would be close to the German border. As US First Army and British Second Army squeezed the western and northern edges of the German salient, so Third Army rushed headlong eastwards and then north to create the lower of two pincers—the other formed as the Canadian First Army and the Polish 1st Armoured Division pushed south of Caen. As could be expected, the Germans did not simply give up: they fought furiously to keep the pincers from closing. When they did, attacks from inside the pocket to break out and outside the pocket to break in led to fierce fighting between Chambois and Argentan. When the dust settled, between 80,000 and 100,000 troops had been trapped by the Allied encirclement. Estimates vary considerably, but it seems safe to say that at least 10,000 of the German forces were killed and around 50,000 became PoWs. The rest, however, escaped, but without most of their equipment, destroyed in the battle or abandoned in the retreat over the Seine. Those that did were subsequently to reform, rearm and conduct an effective defense into late 1944. The area is a lovely place to visit these days, very different to the death and destruction that once lay there. I can recall my own father's comments on his shock at what he saw, and as pointed out in the book, especially by the number of horses used by the German army at this late stage of the war. Many died still in their harnesses. Next time I visit the area I will certainly take this one with me. Good value at an RRP of just £9.99 too. In short a great book that will be going with me to Normandy next year.